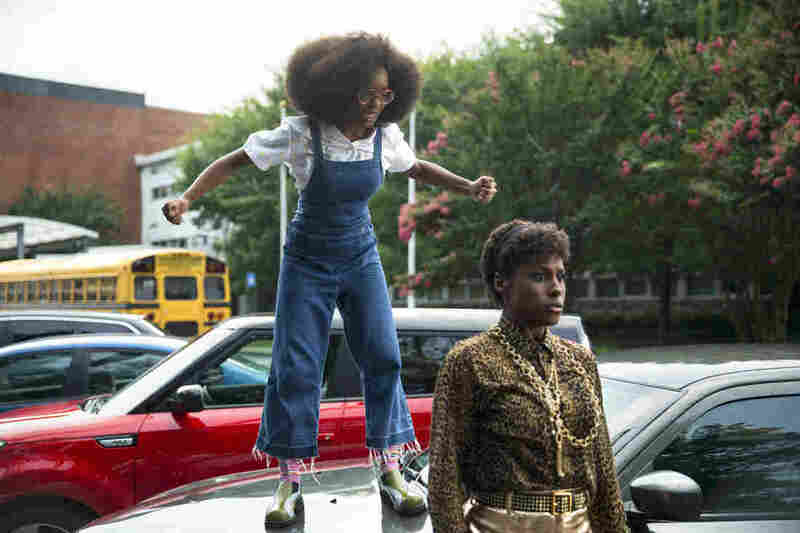 Review: Despite Marsai Martin And Issa Rae, 'Little' Can't Make An Impression There's a lot to like about Little, including the central performance of Marsai Martin. But the jokes are a little too slow to pull the formulaic story along. In Little, Marsai Martin plays a tech mogul who turns into a 13-year-old version of herself. Issa Rae also stars. If you've seen her as Diane, the younger daughter on ABC's Black-ish, you might already know. Diane is wise, wily, funny and a step ahead of her twin brother, Jack. And while scripts work wonders, you cannot create a character like Diane around an actress who wasn't yet ten years old when she was cast in the role unless the actress in question has the chops for it. Martin's first starring role in a film comes in Little, where she holds the screen opposite comedy powerhouses Issa Rae and Regina Hall. What's more, everyone involved in promoting the movie says it was her idea — which she pitched when she was ten. Now, at 14, she's an executive producer on the film. The premise of Little is a variation on the body-swap comedy that boomed in the 1980s. Here, we begin with Martin as Jordan Sanders, a 13-year-old who suffers humiliation and swears to never be taken advantage of again. Next thing you know, we flash forward a couple of decades and she's grown up to be Jordan Sanders, a 38-year-old tech boss and nasty bully played by Hall. Jordan is awful to everyone, particularly her long suffering assistant April, played by Rae. A little bit of magic ensues, and one morning, Jordan wakes up to find that she is back in her 13-year-old body, making most of the film a two-hander starring Rae and Martin. As a child, Jordan can't run her company, she can't drive her car, she can't hit on attractive men, and she doesn't fit into any of her beautiful clothes. She tells April her secret, and the two set out to navigate the world for however long it takes for the spell to be somehow broken. There's not a lot to the story; it amounts to "don't be a bully" and "love your inner child." Will Jordan learn to be kinder? Of course. Will she warm up to April? Of course. These are the things you already know. What drives the success or failure of the film is the comedy and the performances. There are moments when Little fulfills its promise: Martin and Rae play off each other beautifully, Rae is as funny as she is on Insecure and as charming as she is in everything, and Martin is the rare child actor who brings not a bit of preciousness to her performance. Every time someone calls tween Jordan cute or adorable, it clangs wonderfully, because Martin is playing the role with nothing cute or adorable intended. Although they don't particularly resemble each other physically, Martin consistently brings to mind the character we met when Hall played her. They have the same way of talking and standing and insisting, and it never seems implausible that this is the same character in a different body. That's hard to do. It's one of the things that doesn't work in Shazam!, in fact. Unfortunately, the film needs more comedy and more consistency in the comedy it has. When it's funny, it's really funny, but it's not funny frequently enough. The script comes from both the director, Tina Gordon, and from Tracy Oliver, who worked on Girls Trip. Gordon was one of the writers on Drumline, which means between the two of them, these women have great credentials. But the laughs needed to come faster without quite so much pleasant but unremarkable plot execution. The fact remains that Martin has an ability, almost as specific as a party trick, to seem precisely like an adult in the body of a child. She can pull off straight dramatic acting such that behind her eyes, you can see an adult — you can specifically see Regina Hall. She is, again, a star. But with a story this rote, the comedy is everything. And the comedy isn't quite there, even if the central performance is really something to look at.